Superior Share prides itself as being one of the most ambitious affiliate programs on the web today. This is the affiliate program that promotes the online gaming portal, Superior Casino and 24vip. The casino is powered by Rival Gaming software, one of the best known software developers in the industry. Launched in 2006, the casino offers players a wide range of games from slots to roulette to blackjack and video poker among a host of other exciting titles. This casino is known to generate some of the best retention and conversion rates in the casino scene, which basically translates to affiliates earning more for every referral, for a lifetime. The Superior Share Affiliates program seeks to provide affiliates with the opportunity to earn substantial amounts of revenue through promoting a top notch casino. This program boasts of providing affiliates with great features that make adding its casino marketing materials to their websites to be as easy and as appealing as possible. The casino which focuses mainly on South America, Europe and the UK also accepts players from all over the world but at the moment, players based in the US and those from Canada are not accepted. 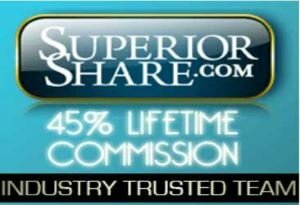 members of the Superior Share Affiliates program earn generous payouts based on the revenue share model that is pegged on a Net Revenue Commission Plan. This affiliate program model offers a revenue share commission rate that stands at 30% for every new affiliate, and this percentage value can climb up to 45% for a lifetime depending on the affiliate’s performance level. There is no CPA [Cost Per Acquisition] model plan listed with Superior Share. The program has no bundling structure and no negative carryovers which expressly means when the balance is negative, the affiliate starts at zero on the first day of the following month. Affiliates get to earn their commissions based on the gross revenue that the players they have referred to the casino have generated. This return percentage on the net revenue share that an affiliate stands to earn naturally goes up as the revenue accrued out of the players an affiliate has referred to the program goes up.As with every affiliate program, the affiliates basically earn these commissions by hosting ads on their own web portals, which in turn generate traffic for the casino. The traffic which is converted to depositing players who sign up counts as a source of potential revenue, and the profits are then plowed to the affiliate partner. The Superior Share Affiliates program allows affiliates to sign up to its one-tier sub-affiliates plan which in turn allows them to earn a portion of the revenues sub-affiliates bring in. An affiliate who refers other affiliates to the program gets to earn a 10% commission of the traffic the sub-affiliate has generated. This means the sub-affiliate belongs to the affiliate, who from then on will earn commission revenues based on their sales for a lifetime. By default currency when paying the commissions is the US Dollar, and the minimum payout value is set at 1,000 USD for Bank Wire transfers, and 100 USD for the E-Wallet model. The Superior Share Affiliates program is powered by the Rival software platform which provides constant monitoring of the program system in order to ensure affiliates receive up to the minute and accurate statistics of their referrals. Webmasters are also provided with exclusive widgets plus progressive flash games and live tickers for their websites.